In Steven Spielberg’s 2002 film Minority Report, Tom Cruise’s character goes to a shady, back alley doctor (Peter Stormare) to get his eyeballs replaced. While Cruise recovers, a wall-sized television projects an image or Robert Ryan shooting a man in a Japanese-style hot tub. That short, violent, beautifully shot scene comes from Samuel Fuller’s brutal 1955 noir classic House of Bamboo, and it seems an odd reference for Spielberg to make. While Spielberg is a technically brilliant director on many levels, he lacks the sensibility to make a movie that is as bleak and morally challenging as Fuller’s. In fact, Minority Report is a good case in point: for most of its running time, the film presents a world that is completely dominated and controlled by an elaborate surveillance system that the hero cannot escape, until the very end, when we find out that there is a space free of surveillance where humans can live, happily ever after. It’s as if Spielberg got within inches of making a profound statement about surveillance and control but blinked at the last minute and went for the safe ending. 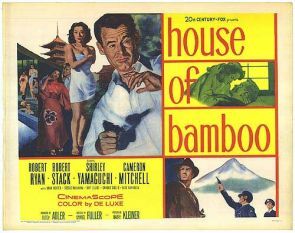 House of Bamboo has little to do with surveillance, though an underground network of criminal informants does factor in to the film. Instead, where it–and most other Fuller movies, for that matter–contrasts with Spielberg films is that Fuller doesn’t give his characters an easy out from the cruel and violent world in which they are immersed. Fuller’s film takes place in post-war Japan, and it’s filmed in color and Cinemascope, making it a bit of an oddity for the classic film noir cycle of the ’40s and ’50s. An American hood named Eddie Spanier (Robert Stack) comes to Japan at the invitation of an old Army buddy, who has promised Spanier a gig with the local mob. Spanier’s buddy, however, is killed, gunned down by his own men during a botched robbery. Eddie then decides to get revenge with the help of his buddy’s secret Japanese bride, Mariko (Shirley Yamaguchi). Eddie’s method for gathering information is brilliant: he goes to various Tokyo pachinko parlors and shakes down the managers for protection money. He first enters the parlor and asks an employee for the manager. When the employee doesn’t understand English, Eddie continues, “You know, the boss!” That gets him nowhere, so he then tries “Number One Boy.” “Ah, ichiban!” the employee responds and directs him to the back of the parlor. Then, he shakes down the ichiban for $25, with a promise to return every week. After two tries, this gets the attention of the local mob, run by Sandy Dawson (Robert Ryan). Dawson’s mob consists of former U.S. soldiers expatriated to Japan, and they seem to run all the illegal rackets in Tokyo, with the pachinko parlors as a legit front. Though Dawson at first punishes Spanier for muscling in on his racket, the boss quickly sees that the thug could be of use, especially since the gang is one guy short. Dawson runs a tight operation. In addition to the regular illegal businesses, he also plans regular heists. With each heist, the gang operates on one simple rule: if any man gets injured, he should be shot dead so that he can’t turn informant to the authorities. This had been the plan with Eddie’s buddy, but he didn’t quite die right away, and the police got some important information about Dawson’s operation out of him. Spanier works his way up in the gang, eventually becoming second man, much to the chagrin of the previous second man, Griff (Cameron Mitchell). Eddie also works his way in with Mariko, who is willing to sacrifice her reputation in order to find her husband’s killer. When the cops get tipped to the next heist, Dawson gets suspicious that he has a mole in the group, and he mistakenly targets Griff, who has been acting hinky since Eddie got his promotion. Dawson doesn’t mess around, and he plugs Griff in the famous hot tub scene. Turns out, though, that Dawson was wrong about the snitch: it’s Eddie, who is really a U.S. military investigator sent to infiltrate the gang. Though Eddie turns out to be an ostensible good guy in the end, he’s still a rough and violent man. It’s fun to see Robert Stack play such a complex role–he’s a far cry from Eliot Ness here. Like Ness, he doesn’t mess around, but he’s also willing to go to extreme lengths to keep his cover. And Robert Ryan plays Dawson with a sense of stoic calm that makes him a formidable and intimidating villain. Eddie and Sandy are not that far apart in the way that they approach their jobs, and it’s easy to see how they connect so quickly when Eddie enters the organization. Both have also sacrificed their personal lives–and, in Dawson’s case, connection to his home country–for the jobs they do, and those jobs happen to be pretty brutal. The film is also beautifully shot. Fuller uses the entirety of the wide-screen Cinemascope frame while also keeping the film’s noir sensibilities–which normally lend themselves to tighter, more intimate shots–intact. The final shootout serves as an excellent example. Fuller shoots this from far away, giving the scene an impersonal feel as two violent men do their violent jobs. The movie often gets a bad rap for the cold and impersonal way it depicts violence, yet that seems to be the entire point that the movie is making. The men in this film are almost all U.S. soldiers who stayed behind in Japan after World War II because they simply couldn’t leave that world behind, and they found a new way to keep fighting under the same leader. Like many of the best violent movies–and many of Fuller’s best movies–it serves as a commentary on and indictment of violence, which makes its cold, distant conclusion all the more unsettling. Previous PostNews Briefs for Thursday, July 22Next PostBureau Chiefs Poll: Does This Look Infected?